You’re reading novel The Demonic King Chases His Wife: The Rebellious Good-for-Nothing Miss Chapter 248 online at LightNovelFree.com. Please use the follow button to get notification about the latest chapter next time when you visit LightNovelFree.com. Use F11 button to read novel in full-screen(PC only). Drop by anytime you want to read free – fast – latest novel. It’s great if you could leave a comment, share your opinion about the new chapters, new novel with others on the internet. We’ll do our best to bring you the finest, latest novel everyday. Enjoy! However, time seemed pa.s.s very slowly. By the time Su Luo’s consciousness returned, the fight had already ended. Liu Chengfeng’s head, face and body were all covered in blood. His eyes were lifeless, his hair was in a mess and his clothing was ragged. The him right now looked extremely pathetic, simply unbearable for people to look at. He was the only one left standing from Liu Manor, and also the only one that was not injured. Yet, the unharmed him now seemed to be in a more horrible state than those that were injured. He could be seen standing there in a daze, stupidly staring at the carriage. Both of his eyes were opened wide like circles, as if his whole person had become an idiot. No matter what, he was unable to regain consciousness. As legends had it, His Highness Prince Jin’s most terrifying trait was not his martial arts, but rather, his temper. Legends had it, His Highness Prince Jin was temperamental and capricious, cruel and tyrannical… … One moment smiling as if it was clear skies and light breezes, then the next second, his longsword was already unsheathed. Legends told that, the martial world had countless legends regarding His Highness Prince Jin. He obviously knew it yet he still deliberately violated them. He really was idiotic and thoroughly foolis.h. !.+ At this very moment, Liu Chengfeng regretted everything until his intestines turned green. As if n.o.body else was around them, the master and servant’s conversation almost made Liu Chengfeng roar in rage! He was not just any stray cat or dog; he was Liu Manor’s second young master. The second young master born of the first wife. The second young master who at this point in time was already a martial artist at the third rank! Could it be that in His Highness Prince Jin’s eyes, he was no different from a commoner? In his eyes, was he so intolerable? Liu Chengfeng restrained his anger until his face grew red. His gaze was fixated on the carriage. However, Ling Feng and the Dragon Scaled Horse did not even bother to glance at him and they directly left. Even more so His Highness Prince Jin within the carriage, who had never revealed himself since the beginning. The streets were covered in a b.l.o.o.d.y mist, with a deathly silence all around. The surrounding people had all tried avoiding it by staying far away. Only Liu Chengfeng’s dazed figure stood by his lonesome self. Liu Chengfeng recalled piece by piece of what had happened here. He still could not understand why, he had only wanted to invite His Highness Prince Jin to get off the carriage. Why did he decide to kill them all so mercilessly? Why? Did all these high-level experts from the Liu family die for nothing? And there was still that cyan-colored crystal stone. It definitely must not end up in His Highness Prince Jin’s hands. Wasn’t His Highness Prince Jin a sixth rank martial artist? Their family’s ancestor was also sixth rank and might not necessarily lose to him! Thinking of this, Liu Chengfeng gathered his legs and ran towards Liu Manor. The Dragon Scaled Horse leisurely trotted on the road to Prince Jin’s Royal Manor. Underneath the carriage, Su Luo finally released a relieved sigh. That annoying Liu Chengfeng was finally driven away. She finally escaped this crisis. Hiding under the carriage was never a long-term solution from the start. In addition, Nangong Liuyun…If it was possible not to meet this person, all along, Su Luo did not want to see him. Su Luo had originally planned to soundlessly land on the ground, then wait for the Dragon Scaled Horse to leave before getting up to return to Su Manor. Though her idea seemed well-developed, however in reality, it was full of holes. 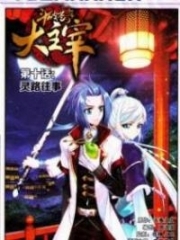 You're reading novel The Demonic King Chases His Wife: The Rebellious Good-for-Nothing Miss Chapter 248 online at LightNovelFree.com. You can use the follow function to bookmark your favorite novel ( Only for registered users ). If you find any errors ( broken links, can't load photos, etc.. ), Please let us know so we can fix it as soon as possible. And when you start a conversation or debate about a certain topic with other people, please do not offend them just because you don't like their opinions. You're reading The Demonic King Chases His Wife: The Rebellious Good-for-Nothing Miss Chapter 248. This novel has been translated by Updating. Author: Su Xiao Nuan,苏小暖 already has 14249 views. Current Time is Apr-19-2019 17:05:18 PM.